This was my present for the wife and I for Christmas and it hit off better than I anticipated! We heard the comments post-release of at least one aspect of the game that rang sour for people and we experienced that in our 2nd game but ultimately: We still love the game a LOT. 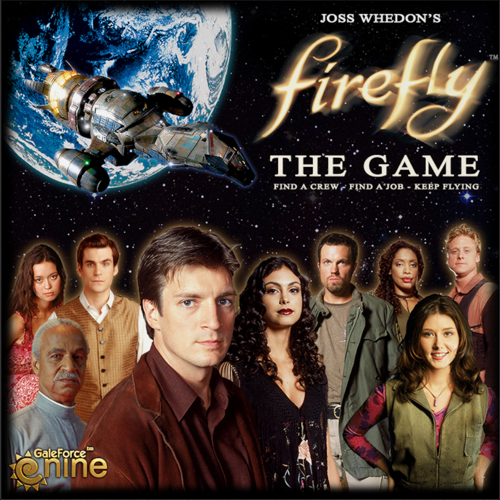 We love Firefly/Serenity and this game is very well done to bring out that dangerous, risky business. Our 1st game was the additional Story Mission from the game site called "First Time in the Captain's Chair". This game was only 75 minutes long and we never felt anything to be a problem and understood all the rules just fine. It was successful in execution with our thoughts. We hadn't come across the cruelty of losing one's contraband for a mission in that play. The 2nd Game (The King of all Londinium) was longer. It clocked in at almost 3 hours but for good reason. I found my progression slow to get where I needed to be but that was just my own fault while Tmara had her contraband taken from her when I placed an Alliance Cruiser on her space. Until she learnt to stop trying to get Nav Cards where Salvage Ops appeared and to start doing missions with some extra equipment. In the end, Tmara clawed her way from nothing to win! This was impressive and I loved that I lost because it literally was neck and neck at the end there. If Tmara hadn't dived into the last Goal (all hail River Tam!) I was one Full Burn away from my attempt and I would have just as easily completed it. To add insult to injury, the planet for the last goal had Reaver on it and while doing a Full Burn, Tmara drew Reaver Bait and then evaded it to end on the Goal planet to solidify her success! It was an epic win to a longer than normal game but it was 100% fun. The game is fantastic for our Firefly itches and the length is respectable but it can derail for a player if something goes wrong. But the major thing is, if it goes wrong, it's because you risked it too much like going on Full Burn through Alliance Space with contraband without a Cry Baby upgrade or something akin to that. It is risk vs reward and it works. The only downside we saw was not so much player interraction except for being able to screw over other players when they Full Burn and a bad card comes up (where another player does the shifting of the Alliance Cruiser/Reaver Cutter) or by giving Disgruntled Crew a better offer to jump ship. The first expansion that is coming will infact add Piracy to the game where you can attack another player and steal their cargo/contraband/etc. The game therefore shows promise that the developer knows what it needs to enhance the game further. The main aspect we want to see is more Story Cards. They are fantastic and varied! The 3rd game we'll be playing this weekend will be one that everyone starts out with a Warrant and has to make $12,000 before they can retire. He/she who gets their dictates the game is about to end and everyone has to take off their cash the Pay of a mission they have yet to complete and see who has the most money left in the end. It sounds fantastic and very different from what we had just done! Overall, very impressed and love now having a Firefly game on the shelf to relive or live on the 'Verse in our household! And as per always, we aim to misbehave! Critical Plays - Star Crusade - Pack Cracking!